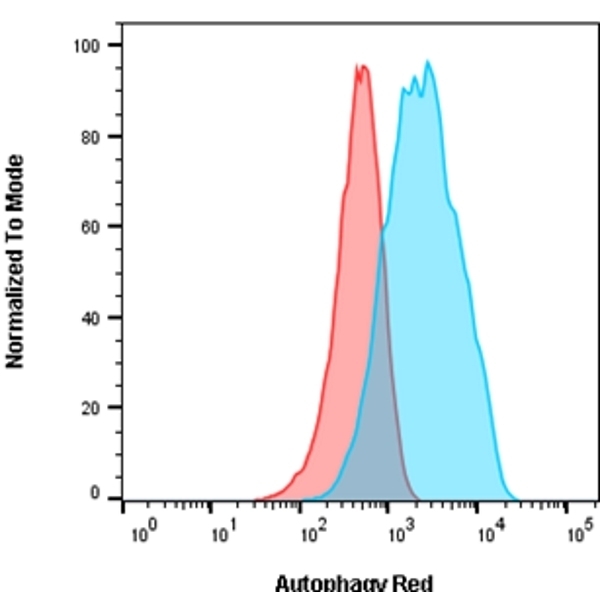 Jurkat cells were either untreated for basal conditions (red) or incubated in HBSS for 2 hours and 10 nM Bafilomycin A for 2 hours (blue) to induce autophagy. After staining with Autophagy Probe Red for 30 minutes, cells were washed and analyzed on the ZE5 Cell Analyzer using the 561 nm laser and 640/20 filter. Autophagy Assay, Red Detection Kit allows for the detection and monitoring of in vitro development of autophagy in living cells. Autophagy is a conserved lysosomal recycling process by which cells break down their own components such as proteins, lipids and carbohydrates. Autophagy plays a critical role in maintaining homeostasis by preventing the accumulation of damaged organelles by disassembling unnecessary or dysfunctional cells and cellular components (Mizushima et al 2011). Autophagy occurs at low levels in the cell under normal conditions and can be rapidly upregulated during times of starvation or stress. Such degradation activities serve to provide nutrients (amino acids, nucleotides, fatty acids, etc.) and energy during periods of elevated bioenergetic demands (Mizushima et al 2011, Levine et al 2008). Another function of autophagy is to assist with the detection and destruction of intracellular pathogens (viruses, bacteria and parasites) (Levine et al 2011). Dysregulation of autophagy has been associated with many disease states including cancer, infection and degenerative diseases (Levine et al 2008). Autophagy is a dynamic process typically divided into three stages. During stage one, cytoplasmic components targeted for degradation are sequestered within a double-membrane phagopore (also called the isolation membrane). This results in the formation of a double-membrane vesicle called the autophagosome. During stage two, the autophagosome fuses with the lysosome to form the autolysosome. Degradation of the autophagosomal contents occurs during stage three (Mizushima et al 2011, Hundeshagen et al 2011). Autophagy Probe, Red is a cell-permeant aliphatic molecule that fluoresces brightly when inserted in the lipid membranes of autophagosomes and autolysosomes. 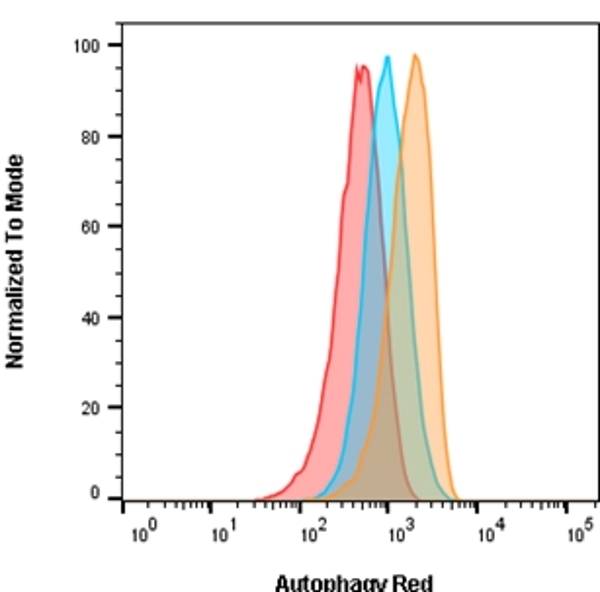 Autophagy Probe, Red can be readily detected by flow cytometry with optimal excitation at 590 nm and peak emission at 620 nm (ZE5 Cell Analyzer settings, 561 nm laser and 615/24 or 640/20 filter). MULTIPLE STORAGE CONDITIONS APPLY ON ARRIVAL. Store the unopened kit (and each unopened component) according to the storage instructions on each component label. Store the Autophagy Probe, Red at -20oC. Once reconstituted in DMSO, the Autophagy Probe, Red stock should be stored at -20oC for 6 months, protected from light. Avoid repeated freezing and thawing. Where this product has not been tested for use in a particular technique this does not necessarily exclude its use in such procedures.